This week is Restaurant Week in Ann Arbor. As a food blogger, I feel somewhat obligated to partake. ..Though, I think the motivation behind the event is to increase restaurant exposure, whereas I’m just out to get a good deal at a local restaurant, whether or not I’ve been there before. Hey, business can’t be bad, right? On the first day of Restaurant Week, I went to Prickly Pear for a $12 lunch. 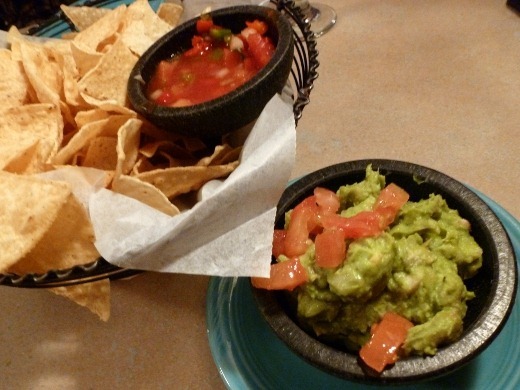 The meal began with chips, salsa to share, and both my dining companion and myself received our own generous side of guacamole. Excellent guacamole, I might add. Fresh, nice and chunky, seasoned well – possibly cumin or some smoky spice mixed in. 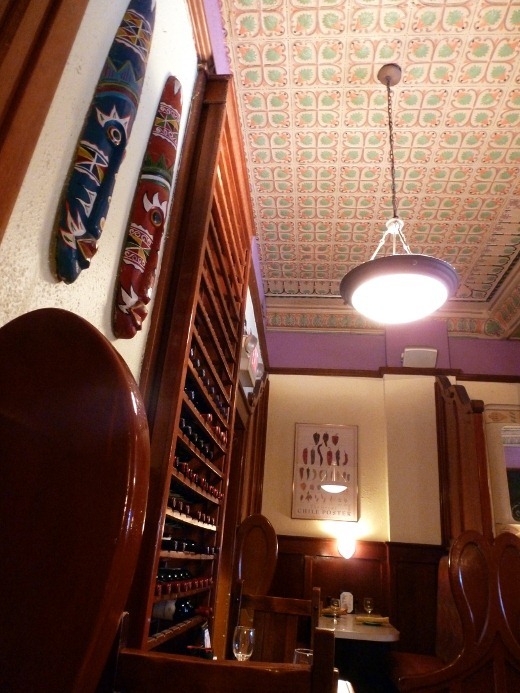 The ceiling of Prickly Pear is so cool! For the next course we could choose soup or salad. 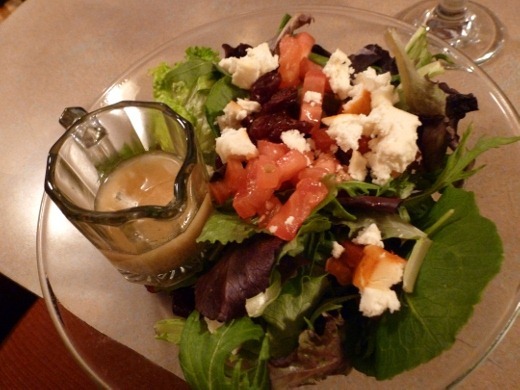 I chose salad, which consisted of organic greens, dried cherries, diced tomatoes, crumbled anejo (which is a mild, firm Mexican cheese), and herb-pepper-wine vinaigrette. Crisp, fresh, and light – I enjoyed this. 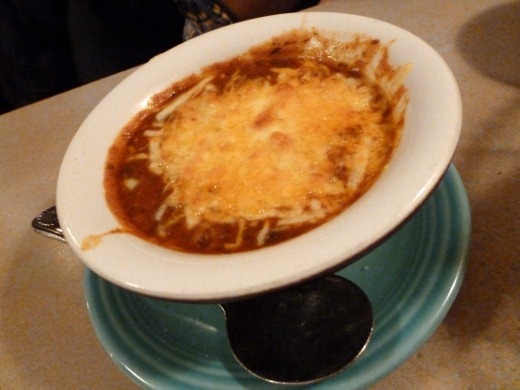 My dining companion chose soup over salad, and selected the chorizo chili. 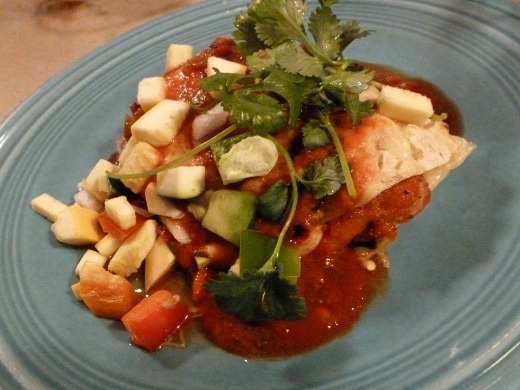 For the main course, diners may select any half entrée or an enchilada. I ordered the sweet potato enchilada, which I have tried in the past and loved. This might not look the prettiest, but within a corn tortilla is creamy mashed sweet potato, topped with a really tasty enchilada sauce and diced veggies. Though I loved my dish, the huz ordered the crab enchilada, of which I had a bite, which caused a mild bout of food envy. Going out for lunch on the weekends always seems like such a treat to me, for some reason. I like it. Currently listening to: This Time It’s Different – Evans Blue. I don’t get to Ann Arbor much, I wish I did, so many great places to eat and sights to see! I’m in Lapeer now, but grew up Downriver. I love your blog and am really glad I cam across it. Thank you for the nice comments! It’s true, we are so fortunate in Ann Arbor to have so many wonderful dining choices! Pingback: Ann Arbor Restaurant Week–Lunch at Grand Traverse Pie Co. « Meg.Goes.Nom.Nom.